The Orcas Island Early Childhood Education (ECE) Community includes: Children's House, Kaleidoscope, and Montessori preschools working together in support of our community and its children. The new conference room at the Orcas Island Community Foundation was buzzing with excitement, as the ECE Initiative convened its first Sustainability Task Force meeting December 7. Over the past four years, the ECE Initiative, comprised of educators from the three schools, education researchers and a small number of donors have significantly increased pre-school access and quality leading to improved kindergarten readiness for our children. The new Sustainability Task Force, facilitated by Jim Connell, met to begin the process of identifying and developing sustainable sources of funding for preschool access and quality in order to maintain and further strengthen kindergarten-readiness. This entry was posted in Uncategorized on December 10, 2018 by Orcas Island Early Childhood Education. The Early Childhood Education (ECE) Initiative is participating in the annual Give Orcas campaign, and has again been ranked a “critical need” grant for the community. A key indicator of a healthy, thriving community is when all its young children have access to high-quality preschool education. When children enter school ready to learn socially and academically, they’re on the path to being productive and successful citizens. The quality of preschool education rests on the quality of what goes on between our preschool teachers and our youngest students. The current ECE Initiative Grant supports program enhancements for teaching quality shown by research to be critical to increasing students’ kindergarten-readiness. The Initiative has been a 4-year collaboration between Children’s House, Orcas Montessori and Kaleidoscope preschools, education researchers and a small number of local donors who’ve worked together with proven results. To ensure this opportunity is available for the next wave of children, the philanthropic community is asked to join parents, preschool teachers, school fundraisers, supporters and others through the Give Orcas campaign May 1-18. 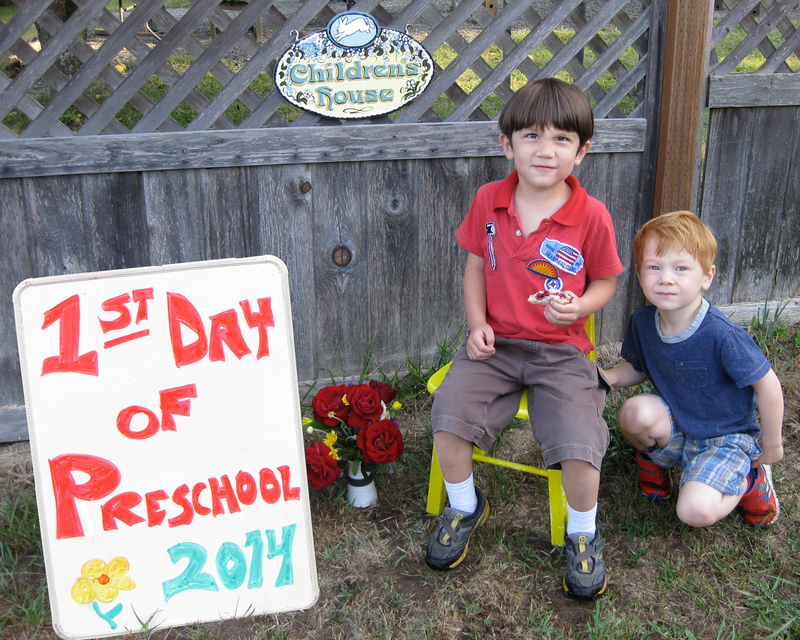 Donors can help sustain high-quality preschool on Orcas by giving to the ECE Initiative grant. This entry was posted in Uncategorized on April 26, 2018 by Orcas Island Early Childhood Education. The Early Childhood Education (ECE) initiative — a four-year collaboration of three Orcas Island state-licensed preschools, private funders, and expert advisors — has produced objective results including universal access to at least 12 hours per week of preschool education for local 3-5 year olds, significant gains in teaching quality and in student learning and development. To date, the initiative has served over 100 preschool students and families in financial need and supported over 20 early childhood educators (all educators in the three schools) to improve teaching practices. Initial evidence provided by our Orcas Island Public School colleagues indicated that almost half of students entering Kindergarten were “at risk” on a nationally recognized literacy assessment (Dibbles.) We asked whether improving Quality — in tandem with Access — in our state-licensed pre-schools would make a difference. By Fall 2016, Dibbles assessment results reported 85% of students from these preschools entered Kindergarten having scored at Kindergarten-ready levels on the state-approved literacy assessment. By Fall 2017, the school replaced the Dibbles literacy assessment with the now standard assessment tool, WAKids, which found 100% were ready in literacy. Results show investments by the Early Childhood Education Initiative on Orcas has been highly successful and provide evidence that investing in quality preschool programs locally pays off in kindergarten-readiness. In 2015, only 44.2 percent of Washington State students entering kindergarten were considered ready in all six domains: social emotional, physical, language, cognitive, literacy and math. While Orcas students tested better at 69.2 percent, we knew we could do better and set about defining the goals that would get us there. The percentage growth in readiness on our island is important because it demonstrates collaboration and investments in our preschools work! Orcas is the ONLY island on which all state-licensed preschools collaborate to improve these outcomes. And it’s the ONLY island that has an actively managed preschool Initiative willing to invest in student access and quality improvements. The WA State Department of Early Learning has set a goal of 90 percent of students meeting kindergarten readiness in 6 of 6 domains by 2020. With support of the Initiative and highly motivated preschools, Orcas Island is well on its way of meeting and exceeding this goal. But this is just the beginning. The ECE Initiative is seeking bridge funding to provide time to develop a collaborative, long-term funding strategy for ECE with OICF and other community partners. LEARN MORE. This entry was posted in Uncategorized on March 8, 2017 by Orcas Island Early Childhood Education. Sunbeams fill the afternoon playground, providing a warm relief against the colder fall temperatures. Leaves float here and there across the playground, then gather in brown heaps enveloped by the sound of preschool voices. Spontaneously a group of four-year-olds begins to dance, tossing leaves into the air, laughing and squealing when leaves brush their faces, sticking to sweaters and hair. In quality early learning environments, children relate intimately with their natural surroundings. They may enjoy the roughness of the leaves on their hands and faces or imagine they’re a swimmer in the leaves, a princess on a soft mattress, a turtle in a shell. Outdoor play is essential for a child’s physical health and brain development. And evidence shows children learn best through open-ended exploration and discovery. In quality preschools, like those on Orcas, free play is spontaneous, pleasurable, self-motivated, imaginative, active, and free of adult-imposed rules. Quality play involves the whole child: gross motor, fine motor, senses, emotion, intellect, individual growth and social interaction. These experiences help students gain confidence and the knowledge they need for later success. Learn more about the impact of outdoor play and open-ended experiences in early development. Read about how the Early Childhood Initiative supports quality preschool programs in our own island community. This entry was posted in Uncategorized on January 22, 2016 by Orcas Island Early Childhood Education. Imagine living in an environment where you were always told, “Don’t touch!” Young children learn about the world around them through sensory experiences and in environments that let them explore safely and at will. In fact, touching is essential for early development. 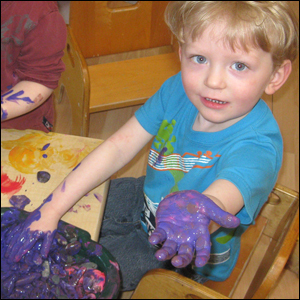 Children like to feel the paint on the page or the wet brush on their fingers; they may even spread the color to their bodies to experience fully what “purple” feels like. In quality early learning programs, educators offer deliberate, experiential opportunities for young children to see, hear, touch, and connect with their surroundings.. These sensory experiences help preschool-age children master the basics of learning readiness — skills which will later help them listen, absorb information, sit still, and learn in a formal setting where information is often provided through instruction rather than experience. At play, young children use hands-on exploration and sensory learning to gain experience building and testing theories about their world, continually constructing new meaning and knowledge. And these experiences help students gain confidence and the knowledge they need for later success. Learn more about the impact of touch in early development. Read about how the Early Childhood Initiative supports quality preschool programs in our own island community. This entry was posted in Uncategorized on September 30, 2015 by Orcas Island Early Childhood Education. Evidence shows young children need more than intellectual or motivational skills to be successful in school. They must be able to understand the feelings of others, control their own feelings and behaviors, and get along with their peers and teachers. By developing good social-emotional skills, students learn to have empathy for others and to establish and sustain relationships. They learn how to manage strong emotions and express feelings in constructive ways. The child’s social-emotional development influences all other areas of development — cognitive, motor, and language development . Quality preschool programs incorporate experiences and teachings which promote development of these skills . Understanding that children learn social skills best by modeling, repetition and practice, experienced teachers work with students to build language and other communication, that help with emotional growth and problem solving. Teacher Jenny watches Liam’s face sink and tears begin to well in his eyes. She asks Liam to verbalize his feelings and listens carefully to the problem. Learn more about the impact of social-emotional development in early childhood. Read about how the Early Childhood Initiative supports quality preschool programs in our own island community. This entry was posted in Uncategorized on August 31, 2015 by Orcas Island Early Childhood Education.